Ready for the most shocking TWD news of 2018? Andrew Lincoln, Rick Grimes himself, is exiting the series during Season 9…..whaaa? No sooner does AMC breathe a sigh of relief over successfully re-negotiating the return of Lauren Cohan than they turn around and watch a bigger actor run out the door. 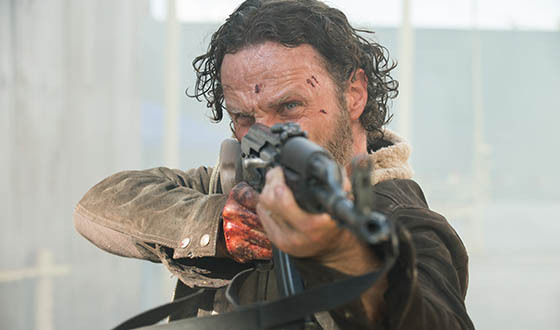 Collider broke the news early this afternoon, and reported that Andrew Lincoln will only be appearing in half a dozen episodes. This means he could very well meet his end as soon as Episode 6, whether by zombie chomp, backstabbing conspiratorial friend, or otherwise. TWD has been leaking like a sieve over the past year, with Carl exiting, Morgan getting transferred to the spinoff, and now this, potentially the most devastating blow the show has ever taken. It also means the show will continue to stray further from being a straight adaption of the book version. The thing about Kirkman’s comics is that none of the “actors” ever get itchy to take on other projects. AMC is now desperate to plug the leak and stop the cast from shrinking any further. We hear they are now offering Norman Reedus significant financial compensation to consider taking over the lead role — likely bags of money with dollar signs on them. They’re also giving Enid a bigger role, but that should last until someone comes offering the role of Batgirl.